Canadian market rectangular steel case model. 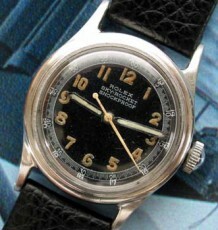 A rectangular steel case model unique to the Canadian market. 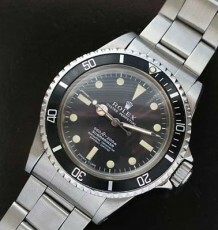 This model uses a locally made fully signed Roelx steel case and has the model number 475 stamped on the back along with a serial number 271010. 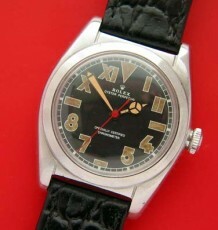 The watch dates to the 1940’s and the plain steel case has a curved caseback. 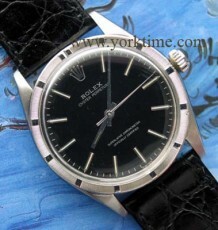 The watch is fitted with a 17 jewel Rolex signed caliber 59 movement based on the Swiss ebauche FF30 barrel shaped movement. The movement was just serviced and is keeping great time. 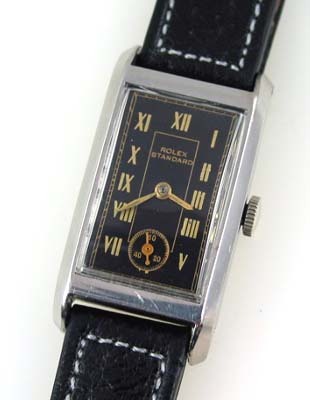 The black gloss dial, with gold roman numerals, has been recently refinished and is in excellent condition. The case measures 20mm wide by 37mm long and the watch is supplied on a new black stitched fold-over strap, as the case uses fixed lug bars.